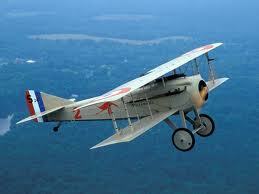 The French uprated their well-proven Hispano-Suiza engine that had proved such a success in the 1916 SPAD VII fighter. Now rated 200-hp, new and improved versions of the fighter were designed around it and one of these was the SPAD XIII mounting two synchronised Vickers machine guns. Entering service in Spring 1917, the SPAD XIII was destined to become one of the war’s outstanding fighter aeroplanes. Produced in great numbers by SPAD and five sub-contractors it was operated by all the Allied air services and became standard equipment for the AEF aero squadrons where top airmen like Frank Luke (The Arizona Balloon Buster) and Eddie Rickenbacker gained many victories flying it. The SPAD was an immensely strong aeroplane and gave its pilots extreme confidence – especially in a dive. It became the favoured mount of many French, Belgian and Italian air aces.